KVS PGT Physics Exam Guide: Hello Aspirants, as we all know that the Kendriya Vidyalaya Sangathan is going to conduct written test for 8339 posts of Teaching Staff. Candidates who have recently applied for the post of KVS PGT, now they are started looking for Best and appropriate Books for PGT Physics Exam. 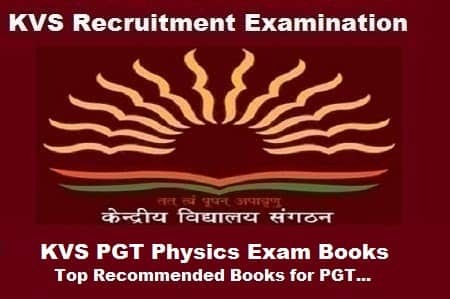 there are many KVS PGT Physics Books which are available for the same subject, now choosing an appropriate book according to the KVS Recruitment examination pattern is a very Crucial problem for all the aspirants. so in this article, we will provide you with the detail information about the KVS PGT Physics exam Preparation Books. To download the complete syllabus and concern topics of KVS PGT Physics Subject please click on the given link: Click Here. This book is recommended for candidates preparing for the CTET and KVS exam. Read every page of this book as many times as you can. it will help you to score better in KVS Examination.